ermans love board games. A lot. In fact, they publish more board games each year than any other country in the world! That’s how much we love them. Now, mind you, I used to love them a lot more until I got married to the most competitive board game player in the world. I introduce her to games and after playing once or twice she gets so good at them that I never want to play again. And yet I keep playing. Nothing demonstrates this German love of board games better than the annual Spiel convention in Essen. Spiel is the German word for game, just so you know. This annual convention is four days long and is the biggest, public gaming convention in the world. Yup, larger than GenCon! This year it was 10 halls of the convention centre, packed full with gaming goodness. Board games, card games, games for small kids, war games, pen&paper and LARP, big booths full of second-hand games, etc. We hadn’t made it to the convention for a couple of years, even though it’s only about 45 minutes away from where we live. This year, we made it out there on a Sunday, accompanied by a couple, my spouse’s co-worker and his wife. They were a lot more prepared than we were, because they brought huge backpacks along for ease of carrying, and we didn’t bring anything. Little did we know. When we got there, we got lucky, because a bunch of people were looking for more folks, so they could buy a group ticket. Considerably cheaper! We filled out their group, one of the guys collected money, bought the tickets, and we merrily parted ways. Only nerds are so efficient. The couple we went with were eager to get into the two halls dedicated to LARPs and pen&paper games. They made me wish I still had time to play pen&paper regularly, because those were good times. This meant that Cinna and I were pretty much on our own for the rest of the day. Which was fine, more time for us to get a look at board games. Unfortunately, it was so crowded on Sunday that we did not make it into any playtesting. We watched a lot of people playtest, so we got some impressions of new games, but there just never seemed to be any room for us to play ourselves. We didn’t try that hard though, mostly because we didn’t want to stand around waiting for a long time. We briefly watched a game of the Carcassonne World Championship. I think it was Austria vs Finland. Two very serious-looking guys who played Carcassonne like other people play chess. The tournament seemed very male-oriented but I am pleased to say that the Carcassonne world champion 2011 is a lady from the Netherlands, Els Bunten. Woot! I didn’t see her play, unfortunately. Apparently it was the first world championship that was not won by a German. 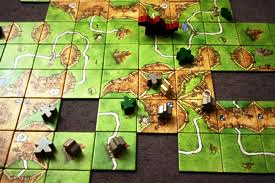 If you haven’t played Carcassonne, it’s a fun tile-based building game that is very very easy to learn, and IMHO very hard to master. It’s also the game that my spouse is so good at that I refuse to play it with her. Ahem. We ended up buying a couple games, but I wish we bought more. We bought the heaviest game in the world (which is what it felt like), Qwirkle, Spiel des Jahres, board game of the year. I will tell you more about that and my upcoming Spiel des Jahres series soon! I also managed to get my hands on a used copy of Sherlock Holmes Criminal Cabinet. It was THE favorite game of mine as a young teen. Nothing ever fired up my imagination like this game. You can play it solo, competitive or as a team effort. What other game can claim that? I am looking forward to playing again. They had an incredible deal on Alhambra, the core game and all expansions for like 40 Euro, but I just couldn’t convince myself to buy it. In retrospect I am totally regretting it. I also wish I had spent more time checking out 7 Wonders, it’s supposed to be phenomenal. We also bought us two Carcassonne bowls. 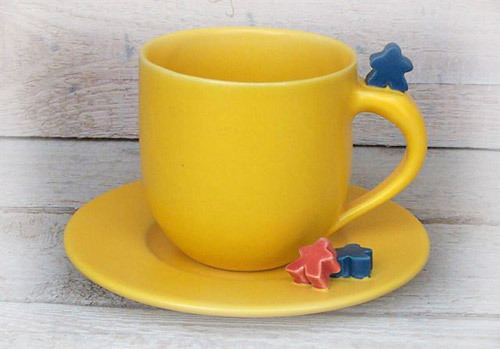 Pretty ceramic with meeples? Check! Look at how lovely this stuff is! Yes, it’s a mug in the picture, I couldn’t find any of our bowls and am too lazy to take a photo right now. You can check out more of their gamer ceramics on their website. Remember when I mentioned that our friends were better prepared? They had all their purchases and their jackets in the backpacks, whereas we sweated and had to carry our heavy purchases around, until I had enough and checked both items. There were a lot of folks who ran around with shopping strollers stacked high with games in them. A perfect place for Christmas purchases, because games were very cheap! Many bargains to be had. Next time. I definitely noticed a lot more international publishers at this convention than in the past. It’s still dominated by the German giants, like Schmidt Spiele or Amigo for all things TCG, but there were a lot of smaller booths with American or Scandinavian, or even Korean games. We tried a Korean game, but it was so bizarre that we didn’t really wait for a coach to assist us with it. I had fun, but next time I would definitely maybe take a day’s vacation and go on a Thursday. The Sunday family crowds were a bit too much. I think I need to go to Germany. I annoy my friends with how much I love board games! O.O I never thought of board games as geeky, unless we’re talking RPGs or Magic: The Gathering. My usual fare is party-style games where people tend to get into shenanigans, like Cranium or Quelf. I’m a theater nerd at heart so I love anything that will break people out of their shells. Another big favorite is Fluxx (or Zombie Fluxx); it gets so stinking technical if you end up with too many rules, haha. I’m an only child so I frequently played board games by myself when I was young. I would play as both sides. 😛 A few years ago it was tradition to trek to LA to see a mutual friend of ours for Christmas. The highlight of the evening (for me) was when they busted out Fluxx or some other interesting game. A couple of the guests would get super technical with the (sometimes) complicated rules. I don’t know why but I always had so much fun. I am at a loss though – what is a German-style board game? Do you recommend any? I’m always up for new favorite board games. I think this is awesome. I had no idea there were conventions for board games like this out there! The most famous German style board game is certainly The Settlers of Catan. The game sort of started a board game renaissance when it was released. Suddenly it was really hip to play! In Germany alone the game has sold over 8 million copies. It’s been translated into many languages, and is available in the US. It’s a beautiful, complex game that has only one downside for me: you need 3 people minimum. There’s a 2 player card-game version of it which is also excellent. I will review this game in some more detail another time. Two more big German style games are Carcassonne and Puerto Rico. Also available in the US. I love board games! I recently traveled across my country solely to drink coffee and play board games with some old friends. My roommates are pretty into board games as well, but they’re way more into the pen & paper thing than I am. Clearly I need to visit Germany at some point! I’ve gotten into board games relatively recently. My first game was Stone Age (another awesome German game) and I’ve been playing the gamut of game types; from Carcasonne, Agricola, Small World, Saint Petersburg and Alien Frontiers to card games like Gosu, Dominion, Thunderstone, Ascension and Nightfall. I would highly recommend 7 Wonders and the expansion for it. It is a really good game and you can get a few games in a relatively short time. If you ever in the States I would recommend going to Origins (http://www.originsgames.com/) in Columbus, Ohio. It’s a bit smaller than GenCon but my group seems to prefer it over GenCon (although they go to both). Oh and PS, long time reader at Tank Like A Girl. Glad you are still blogging! Isn’t Stone Age a stone age version of Carcassonne, with rivers and such? I only vaguely remember it. I love Dominion, one of my favorite games. The problem with 7 Wonders is that you need a third player, but I am interested enough that I will likely pick it up anyhow. Glad you are still reading whatever I blog about. I don’t think I have a lot of readers left, haha. But that’s fine.